Adam Payne here with my long overdue Clickfunnels Review. 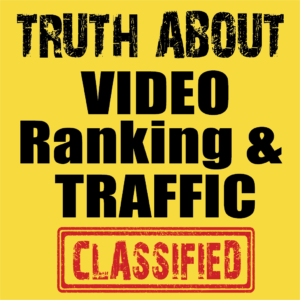 I am sure you have heard of Clickfunnels by Russel Brunson but if not, you can get educated about it right here as I am going to give you a down and dirty review with nothing left uncovered. Unlike many reviewers, I actually own Clickfunnels and have had it for several years, so you know this Clickfunnels review will be based on my own real experiences, and not something I have pulled from my backside in the hope of some commissions. 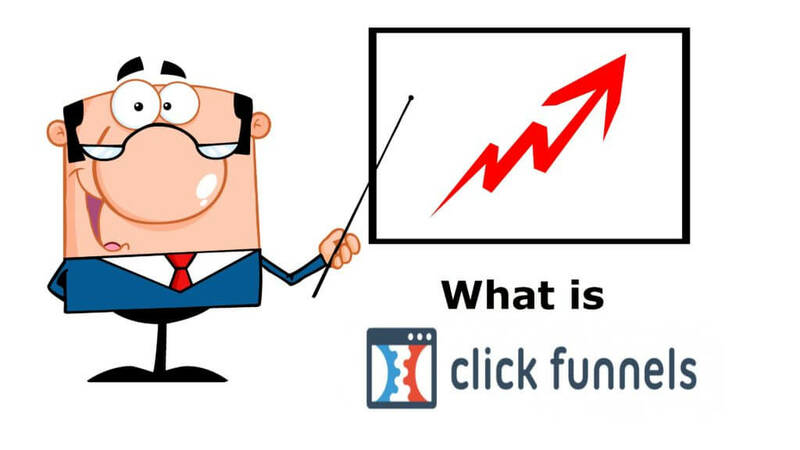 ClickFunnels is all about making people more cash. 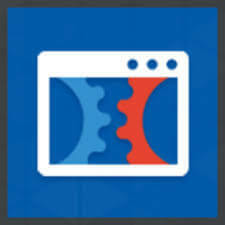 It does this by giving businesses and individuals software that helps them turn their website’s visitors into customers. There is no denying it’s popular. But is that because it is worth it, or some slick marketing? Who do you trust? The Affiliates, or the naysayers? 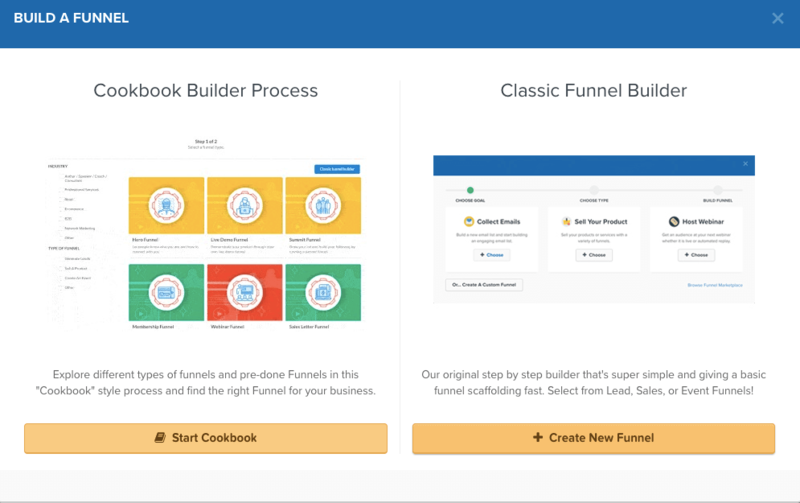 In this Clickfunnels review, I’ll go through what it is, the pros and cons, the features, the customer service, and all the bits in between. Before We get started, I think it’d be useful for me to give an overview via video. 1 How Quickly Can I Build a Sales Funnel? 2 How can I use Clickfunnels to build a list? 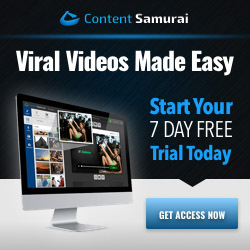 6 Will Clickfunnels Make me Money? 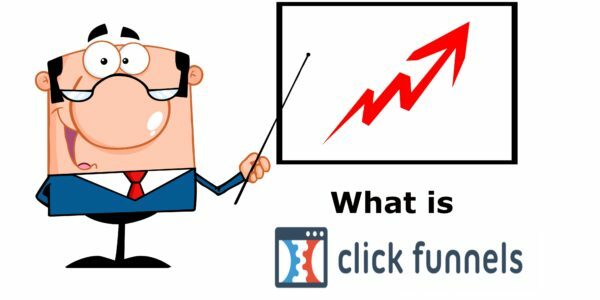 So that is a quick review of the Clickfunnels platform, now let’s look at actually using it to build your business. 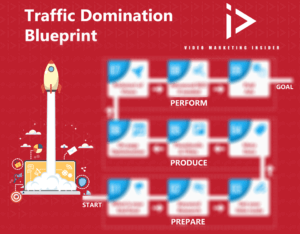 How Quickly Can I Build a Sales Funnel? For most of us, time is the one thing we lack. And so having the ability the quickly create landing pages, thank you pages, webinar pages and more makes life much easier and less stressful. Most folk are not clued up when it comes to coding (me included) and so page builders make life so much easier. 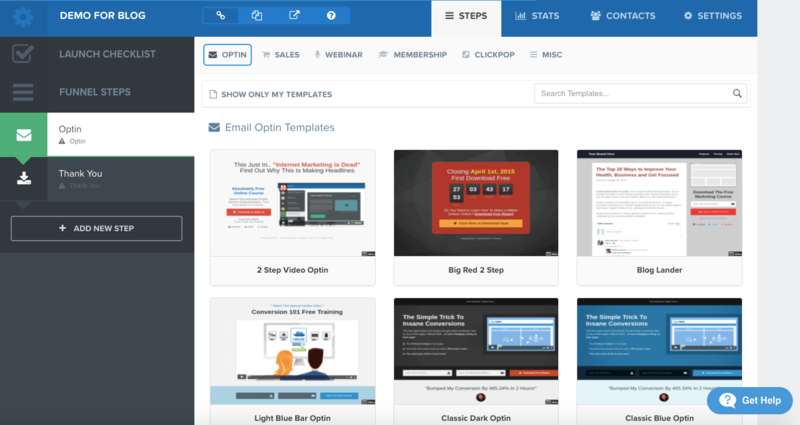 But just how easy is it to build a simple sales funnel? Well, the proof is in the pudding. Let’s have a look. Choose from the main 3 options depending on your end goal. Choose from the array of templates. From here, it is a case of editing them to suit your needs and integrating other platforms you need. That looks fairly simple but is it? Well, read on and we will see a video on this in action. How can I use Clickfunnels to build a list? I have heard some people complain that you cannot really change the templates. That they are too rigid. Well, here’s my take on that. Templates are there because they convert. They have been proven to do so in various niches. So if it’s not broken, don’t fix it. If you really want to, you are able to create a brand new page from scratch but I would only advise that when you get accustomed to using Clickfunnels. Not everyone uses Clickfunnels of course and their is some stiff competition.Let’s have a look at some of the other players around. There are plenty of other options to Clickfunnels available all with different pros and cons. While it would not be fair for me to attempt to make full comparisons, I will highlight what I know. Convertri. While you may not have heard of it, Convertri has proven a popular alternative. It’s main selling point is its page speed. It loads up like lightning which is vital for conversions. Optimize press 2 This blog was build on OP2. I like it and it has a cool page builder element too. $297 for use on all sites. WP Profit Builder This a WordPress solution. $67.67 for use on all sites. InstaBuilder 2. I use this and like it. It does have a bit of a learning curve. It has 100 + template and a drag and drop page builder too. $197 to use on ALL your domains. Other options include: Kartra (new), Divi and Igloo. There are others of course, but that is enough for now. 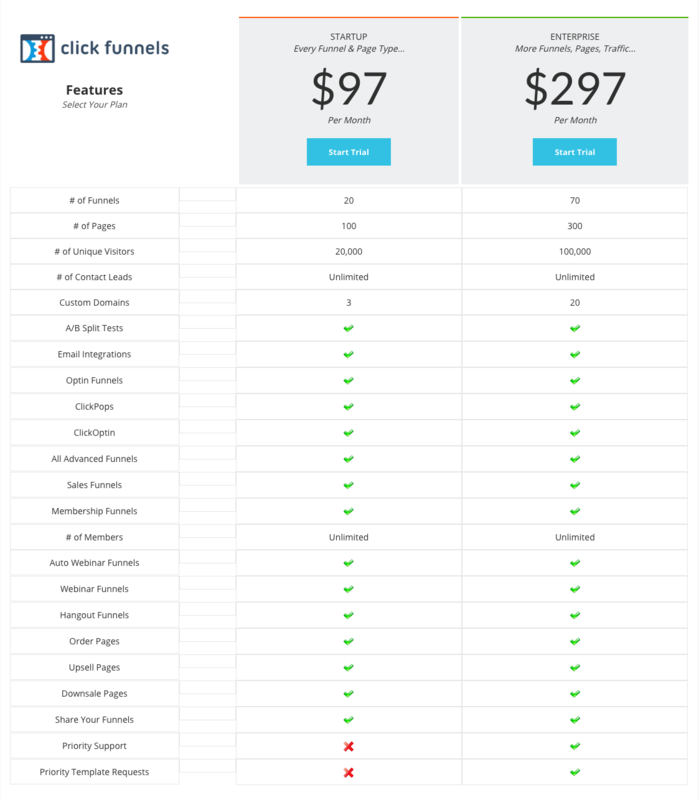 I think now it is time to see the actual pricing and feature of Clickfunnels. Rather than type out a long boring paragraph on this, it’s much easier to provide you with this visual so you can see the difference in options available to you. Look, Clickfunnels, despite me liking it overall, is NOT perfect. Nothing ever is. Here are a few negatives that I have highlighted. Make of them what you will. Now most folk would not say this but I am going to say it. The enterprise plan is not worth it. The start up plan is not only cheaper, but better value for money. The extra functionality that the Clickfunnels enterprise version offers is just not worth it. The email deliverability is not up to par and you should use this for building funnels, not trying to do everything. Leave the emails etc to the pros. So should you go for it, get the startup plan. And ignore the fanboys and fangirls telling you to get all the upsells when you don’t need them. Some folk have complained that customer service is lacking somewhat. In my experience, they’ve been fine. I have had questions responded to with personal videos that have reached me within 24 hours. If you enter one of their funnels, their marketing can be a bit ‘in-your-face’. Once you sign up for something, be careful to remember why you signed up and not to become one of Russell Brunson’s cult followers. 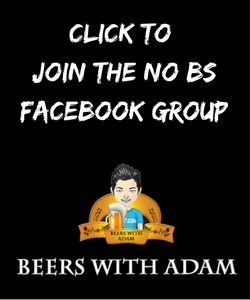 The official Facebook Group has over 100k members and most posts consists of people bragging about how much money they made and flashing their sports cars and cigars. These numbers are real. But this gives the rest of us the feeling that they are more concerned with their own self-image rather than making products & services that actually help others. If you go on Facebook, you’ll see a ton of scammy coaches, product owners and others that use clickfunnels for their own gain. Nothing wrong with making money but clickfunnels has attracted a few unsavory types. I think that is, in part, due to how they market themselves. All that said, there is a polar opposite group of folk who think it’s ‘cool’ to bag Clickfunnels at every opportunity. To me they are just as bad. My advice, for what it is worth, is jut be normal. If you decide to use it, then do just that and try to avoid the cults on Facebook. NOTE: The Facebook group can be helpful when stuck so I am not saying avoid it 100%. just be careful. This is something I disagree with, but some folk bemoan the templates. They complain that because of the templates, there are too many funnels around that you can ‘tell’ are made using Clickfunnels. On the odd occasion ClickFunnels will go down. Stuff happens. We are dealing with technology. If this happens, your hands are somewhat tied. All you can do is sit tight till they are back up. Will Clickfunnels Make me Money? The simple answer to that is yes and no. Alone, Clickfunnels will do nothing for you. It is just a tool. And it is the person using the tool that will determine how much money is made. If you can afford it and if you actually use it, Clickfunnels could be one of the best purchases you make online. It was one of the best for me and has been partly responsible for hundreds of thousands of dollars and many many email leads. That is because I learnt how to use it and then applied. PS…If you have any comments on this Clickfunnels Review, then please let me know in the comments section below.